I think I traced down a draw to the door locks. Does anyone happen to have the wiring schematics for the door lock for a 1998 Olds Cutlass 3.1L? Thanks DS! I knew one of you would come through. I haven't done much with electrical on vehicles so could use some help. (still have to get my uncle's grand marquis where the headlights go out when you hit the left turn signal but that's later on) There's definitely a draw on this Cutlass. I checked each fuse doing a voltage drop test. All went to zero except for the door lock fuse. That means that's where my draw is, correct? The next thing I did was disconnect the electrical connector from each door lock switch (one at a time) and repeated the test. The same thing happened. Not so sure where to go from here. I was thinking maybe checking continuity on wires. Could a bad relay cause a draw or would the power locks not work? This is why I want to look at my uncle's car too. I don't know squat when it comes to a vehicle's electrical system. Do the door locks work? Yes they do. That would mean the relay is okay, right? This car has a car starter and aren't they somehow hooked up to the door locks? There was a little toggle switch for the car starter under the dash and I did flip the switch to off before I did the drop down test. To double check that it is indeed the door locks I'm going to leave the fuse out overnight. Every morning she goes to start the car she has to charge the battery in order for it to turnover and start. I haven't checked any of the fuses under the hood yet. I stopped at the door locks because it didn't pass the drop down test. They should all go and stay at zero, correct? If so, then it has to be it. If the doors lock and unlock, you would think the door lock relays aren't sticking on. Not sure about the remote start system. If the remote start system has keyless entry/alarm system it could be tied into the door lock circuits. I'm guessing your voltage dropping the fuses to see if there is current flow. The voltage drop through the fuse shouldn't be very much at all if there is current flow. The voltage drop level depends on how much current is flowing through the fuse too. I honestly haven't tried that method yet. 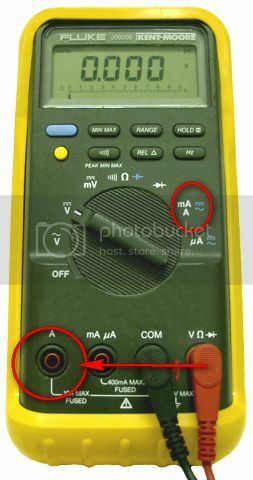 If you connect your ammeter in line with the battery cable and remove the fuse for door locks, does the current go less than 50 mA (0.050 V)? That's right, I've seen you and HT recommend that method before. The wife wants to hangout for a bit so will try that first thing in the morning. When I did the other method, if I remember right and assuming I even had the multi meter on the right setting, it seems like most of the fuses would start at .9 and drop down to 0. The door lock fuse started at .9 went to .1 and went back up to .9. I read that if it does this that it means that's where your draw is. I'm new to this though so have no idea if it's even true or if I'm doing it right. All I know is that that was the only fuse in that block that did that so I assumed that was the one. You do need a volt meter that can read down to 1000th of an amp to be able to get some sort of accurate reading when voltage dropping a fuse, but if your getting some sort of reading you would assume there is current flow. Watched a vid on some instructor doing it by checking the drop across a headlamp fuse with the lamps on and there was a drop of only 29 mV across the fuse. For it to be dropping 900 mV you have one heck of a load in that circuit going through the fuse. I'm not sure if it's 900 mv. The one I used is just some small craftsman meter with only a few settings. It's in auto mode and doesn't say. It's like the size of a deck of cards. About a week ago I rigged up some wires with alligator clips to use with my good meter and now can't find my multi meter or the wires. I'm trying to think if I loaned it out to someone. I knew I shouldn't have cleaned the garage. I put stuff away and then can't find anything! If it doesn't have the right setting I'll have to run and pick up a new one. I was really hoping this little meter would work. I'll find the other one tomorrow, hook it up to the battery, and pull fuses like you said. I'll also find that video to watch. Once I'm certain on where the problem is I'll post back with another few rounds of questions because I know I'll have some. Thanks for the help DS. Last night I pulled the door lock fuse. The battery was reading 13.3 volts last night. This morning it is 12.8 so it did drop some. Normally if it sits for 7 hours it wouldn't start. Do you think it is the door locks or should it not drop at all? I'm still going to find my other meter and do the test DS mentioned to make sure. 12.8 is a fully charged battery, 13.3 reflects a surface charge that will dissipate. MG - gotta be quick as we are getting hammered right where I am with heavy snow and have to plow again for the THIRD time with hours more coming. Battery: Volts don't = amps left AND when regular (almost all) car batteries go dead or too low it's killing them - they hate that. A good battery if you can't load test it at least put a voltmeter on it while cranking and note how low volts go as it shouldn't drop much below 10ish volts just during cranking as a clue it's lost it's CCA ability. Thanks HT....looks like it is the door locks but could possibly be due to the car starter? The key fob is the one that came with the car starter. Then again, the lock/unlock button would be controlled through the car's receiver so would it be separate from the car starter so it wouldn't be an issue? I did flip the toggle switch located under the dash for the car starter so it was off overnight along with the door lock fuse being pulled. Is this when I start disconnecting each device that's part of the door lock system such as the lock motor and perform a voltage drop test after I disconnect each one? Thanks for being patient with me. Stuff like this is what I would really like to learn.. I told DS that the door locks worked, but they don't, so I guess that's another good sign that I found the draw. The numbers you posted earlier don't reflect any draw at all. That battery still had a full charge after being parked overnight. Thanks HT.....I know I need to do the parasitic test to confirm. I just assumed (which I know what assume means) because she would park the car for 7 hours and the battery would be dead. It's a brand new battery and the alternator is good. Last night I pulled the door lock fuse and the battery was still fully charged this morning. Also, the door locks aren't working so I thought that would be another sign that it could be in the door lock system. I'm just going to start fresh and do the parasitic draw test to confirm there's a draw somewhere. I'll then start pulling fuses so see if I can find it. Looks like I'm going to have a heck of time with my uncle's blink/headlight problem. I learn better with hands on rather than out of a book so hopefully I'll gain some knowledge after these two vehicles. Do you have the test procedure? Hook up multi meter between +cable and + terminal. Make sure I pin the door switch so the light doesn't come on in order to get to fuses. Wait like 20 minutes for everything to go to "sleep". If multimeter shows higher than 25-35 mamps there's a draw. I then pull one fuse at a time, and if meter goes down to normal range I found what circuit the draw is on. I then start pulling devices on that circuit and watch for it to drop back to normal range again. I remember reading on here where you explained how to do it and I read elsewhere awhile back so kind of going off of memory. I can always google it again. Thanks for sticking with me on this HT. I always appreciate it. I'd say up to 50ma is acceptable but it's usually not that high. Just make sure you don't activate anything over 10A while your meter is in series or you will fry it. I've tried 3 different multimeters and I keep getting a 1 on the far left. I did get a reading around 88.4 for a little bit but then went back to the 1. If I unhook the lead from the battery it then starts counting down and gets to .08. The second I hook the lead back up it goes to the 1. The multimeters I have are pretty cheap but I figure they'd still work. I even tried different settings. 20m, 200m, 2000μ, and 200μ. Not sure what's going on. I checked volts just to make sure I'm getting a good connection and it reads it okay. Maybe it's time to invest into a better multimeter. By the way, I did check the fuse in each one. I also made sure the lead is in the correct port. Heck, I even tried the other. You're setting it to ohms, not amps. There should be a 10 amp setting. You will also likely have to move the red lead to a different port for amps only. So much for a google search. I watched a few different videos and set the multimeter up how they had it. I think there's more bad info out there than good. Looks like I had better stick to the pros on Car Junky! Okay, I hooked up the leads. It started at .82 and slowly dropped and held steady at .54. Would that be considered a high enough reading to be a draw? I know you said anything over .50 ,and we are, but not by much. My multimeter looks nothing like that. The setting I was using earlier was under a box labeled DCA and then it has 4 settings, 20m, 200m, 2000μ, and 200μ in that box. I had the red lead plugged into the port that had VΩmA. This seemed to be the setting that was used in other tutorials. This last time I moved the lead up to the 10ADC port and put the dial on 10A. That's where I got the .54. I'm not going to waste anymore of your time until I figure out what the hell I'm doing. I'm beyond frustrated right now so can only imagine where you're at especially since you're dealing with a moron!